Through the cross we are redeemed, and this ultimate act of grace on our behalf was also the greatest victoty of all time. Through His death and resurrection, Jesus conquered sin and death once and for all, and this victory is celebrated in this cross sword pendant. This shining 14K white gold piece forms a cross from the gleaming blades of swords, each accented by its own round diamond. An additional stone adorns the center of this unique and meaningful piece. 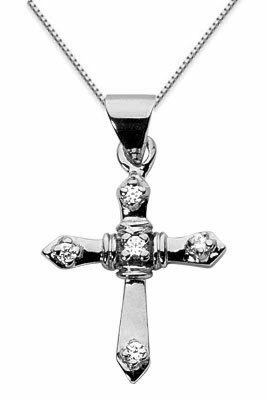 We guarantee our Diamond Sword Cross Necklace, 14K White Gold to be high quality, authentic jewelry, as described above.